The Calgary Stampede’s annual Heavy Horse Pull is a three-day affair. But for this kind of immortality, it’s a year-round proposition . . . and Dennis Weinberger should know. A year ago at this time, the veteran heavy horse pull teamster from Cochrane, Alta., was silently fuming back at home on his Springbank Belgians ranch after finishing second in each of the weight divisions at the 2009 Stampede Heavy Horse Pull. For the previous nine years, Weinberger had won at least one of the pull’s three weight divisions, be it lightweight, middleweight, or heavyweight. He vowed things would change . . . and did they ever. Sunday night under the Big Top, Weinberger made history by winning the triple crown for the first time in Stampede Heavy Horse Pull history. And he did it in dramatic fashion, as the mammoth pulling duo of Dan and Jesse set a heavyweight division record by pulling a 13,200-pound sled the full 14 feet, eclipsing the old mark of 13,100 set last year by the Airdrie, Alta.-based Soderglen Ranches outfit owned by Stan Grad and teamstered by Nicolas Pouso. The Stampede’s Heavy Horse Pull, the richest horse pull in North America, is sponsored by Soderglen Ranches, The Posse, and Wrangler. 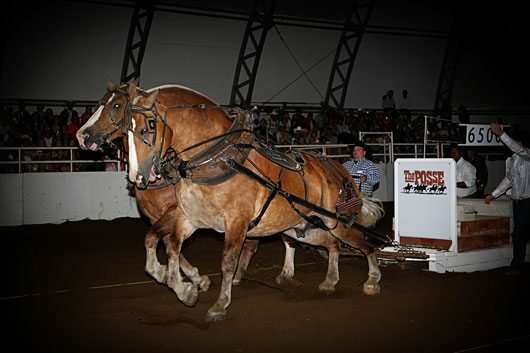 During Sunday’s six-team final before a packed Big Top house, Weinberger’s New West Truck Centres-supported team was the only two-horse outfit that managed a full pull at 13,000 pounds. The Size Matters-supported duo of Billy and Ben, teamstered by Scott Fisher of Edwardsburg, Mich., finished second by pulling 13,000 pounds a distance of 107 inches. Pouso’s Light Speed Trailers-supported team of Ben and Jim, the same horses that set the old heavyweight record of 13,100 pounds last year, had hauled the 13,000-pound sled more than half the mandated distance before stepping out of the pulling lane and committing a line infraction, placing third. Weinberger’s horsepower had already gone two-for-two heading into Sunday night, with the duo of Spike and Kris snaring the Stampede’s lightweight title on Friday while Davey and Dillon captured the middleweight crown on Saturday. Fisher ended up runner-up, or reserve champion, on both Saturday and Sunday, collecting a $2,500 cheque each night – and, as it turns out, was instrumental in Weinberger’s Heavy Horse Pull trifecta. Fisher trained all of Weinberger’s heavy horses from January through June down in Michigan. Fisher is a third-generation puller who competes at horse pulls all across the American Midwest. Weinberger’s team of Dan and Jesse outweighed Pouso’s pair by more than 200 pounds, at 5,326 pounds compared to 5,099, but the Uruguayan expatriate wasn’t using that as an excuse. Rick Byrne of Regina, Sask., teamstering the Bar U Ranch-supported team, finished fourth after managing 97 inches at 10,500 pounds. Bill Martson’s West Nile Farms-supported outfit from Pullman, Wash., bowed out after a 9,500-pound full pull, placing fifth. Randy Dodge’s team from Albany, Ore., supported by Glover International Trucks, was sixth after pulling a 9,500-pound sled 19 inches.